When patron records are erroneously duplicated, they may be merged into one record. As described in the section Searching Patrons, search for the term(s) shared by the two records. Select the two records to merge by pressing down the CTRL key and clicking each record. Click the Merge Patrons button next to the Search Form and Retrieve Patron buttons on the top of the screen. 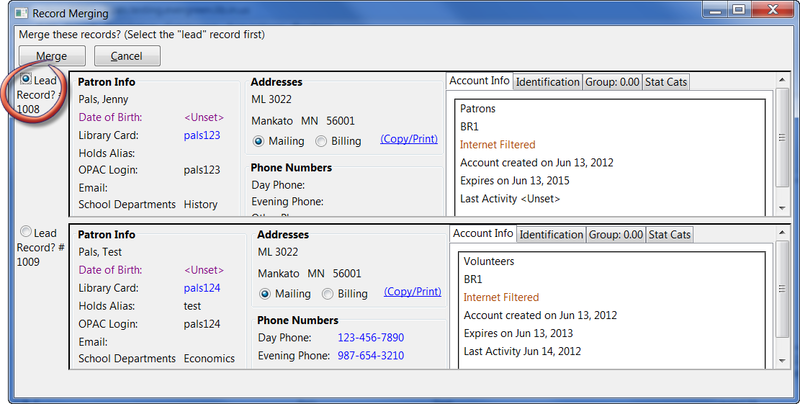 A Record Merging window will display. Compare the two records. Select the record you want to keep by checking the radio button Lead Record next to the appropriate record. After making your selection, click the Merge button. The screen will refresh. Only one of the two patron names will display. Once two records have been merged, the notes, bills, holds and outstanding items under the non-lead record are brought to the lead record. Staff-inserted alert messages are not transferred from the non-lead record; lead record alerts are retained. Patron records may also be merged from the Patron Group screen Retrieve one of the two patron records you want to merge. Go to Other → Group Member Details. The patron records are displayed as group members. If both patron records are not already displayed on this screen, click Choose an Action → Move another patron to this patron group. At the prompt, scan or type the patron’s barcode. Confirm the move by clicking the Move button on top of the screen. Click OK on the confirmation pop-up window. Both records are displayed as group members. Select both records by pressing CTRL key and clicking each record. Click Choose an Action → Merge Selected Patrons. The merging records window pops up. Choose the lead record and continue to merge records as described in the above. 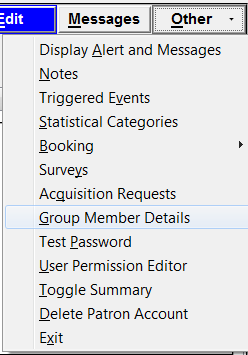 The merged record will still show under group members. Both members point to the same patron record.